Patrick is a Permaculture teacher in Colorado, U.S. and was introduced the Konohana Family from his Japanese friend. He has a 4-year-old-daughter and see a light for the future generation, so he actively connected children in the U.S and Japan by exchanging their drawings. Konohana children also participated in this project. He will continue weaving this connection for future. I have been thinking about you all since the first days we met and I am so happy to be in this life together with each of you. Thank you for being my family and for showing me such love and compassion when I visited you in October 2016. 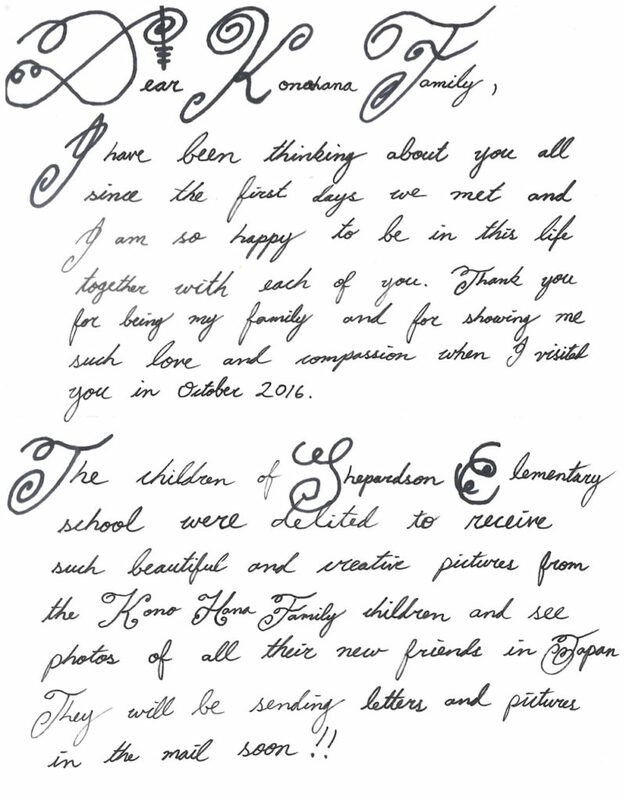 The children of Shepardson Elementary School were delighted to receive such beautiful and creative pictures from the Konohana Family children and see photos of all their new friends in Japan. They will be sending letters and pictures in the mail soon!! Next time I write to you, I will try to practice my 日本語（Japanese）but this time I just wanted to freely share my heart with you. Plus, I am confident that this letter will be beautifully translated and maybe even read aloud in front of everyone; probably after eating a delicious meal and appreciating your beautiful and talented Konohana Children! The sacred water that I offer to your sacred waters is 100% pure snow from Fort Collins Colorado. Have a wonderful festival and I hope to see you all again soon. Catherine is a professor and researcher of Anthropology, and teach at one of universities in Canada. She had studied about poverty for 20 years, and now shift to the theme to Happiness. She visited Konohana Family in that context. After ten days at Konohana Family, I feel refreshed and rejuvenated. Located at the foot of Mt. Fuji, this community of almost 80 members is completely food self-sufficient; so one of the things I enjoyed during my stay was wonderful fresh, organic vegetarian meals made with love by the kitchen staff. But more important to me than the food was the hospitality: I was welcomed by the entire community with smiles all around, and treated with care and generosity throughout my stay. As I watched the daily activities of members of Konohana Family, I noticed that everyone seemed happy and content. The children are strong, healthy, happy and positively engaged in the world; and the adults seem to enjoy every activity they undertake, even the most mundane. And no matter how busy they were, everyone I met was willing to take the time to share their life story with me. The energy of the place is contagious, and I am grateful that I caught some of it!